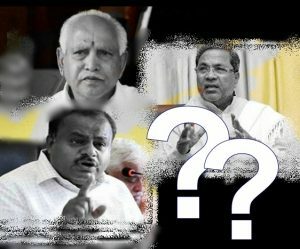 Home Critics court Congress haunted by the sin of unholy alliance in Karnataka? Congress haunted by the sin of unholy alliance in Karnataka? It is said that when there is a great flood, snake and mongoose sit quietly on the same branch of a tree to save their lives. But as soon as the flood water recedes, they resume fighting. This exactly is happening in Karnataka at the moment. Having witnessed this grand deception, how the people of India will trust such alliances while voting for the future of India is a million dollar question. To recap, when Karnataka election results came in and BJP marched ahead taking a massive lead, on more than 110 seats, one of its leaders confidently said that there was no question of alliance as BJP was anyway crossing 110. By now the Congress had lost all hopes and the party was parked in a conceding mode. A blame game had already started within the Congress party for receiving a humiliating defeat. But there was something else in store for the people of Karnataka. BJP ended up falling short of a few seats needed to form the government and with that one of the most shameful political dramas began to unfold. Congress realized it had no chance to form the government but they had to somehow remain relevant to save its face. The only way was to support the JD(S). Apparently the Congress high command got some frantic calls from different state political leaders advising them to do anything on earth to ensure JD(S) accepts their support. They hurriedly offered CM post to JD(S). This was like a lottery for Mr Kumaraswamy. His ambition to become the king and not only the king maker was coming true. BJP was quick in calling it an unholy alliance. Governor Vala, exercising his legal powers, went ahead and invited the BJP, the largest party having people’s mandate, to form the government and gave 15 days to prove the majority. Congress ran to the Supreme Court at late night to stop the oath taking ceremony. This was rejected by he court but it drastically reduced the time limit for floor test after an overnight session. This was a wise judgement. But this triggered another round of one of the worst and most ugly political activities. BJP was accused of horsetrading while Congress played a victim card. It went to the extent of releasing an allegedly fake video showing the BJP trying to buy its member. However, they were embarrassed when its own party member later on said that the video was fake. 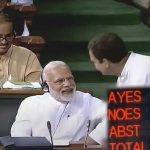 Congress taking its members to resorts, spending a night on the road, challenging Governor Vala’s decision to appoint a BJP member as the interim speaker, Supreme Court accepting it, and BS Yeddyurappa tendering his resignation minutes before the floor test are a few highlights that leave a thick black spot on India’s democracy. The irony, however, is that both Congress and JD(S) along with other anti-BJP parties have called this alliance an essential move to protect democracy! And this is when even they themselves know what it is, i.e. a hard struggle for self survival at the cost of self-esteem. Clearly this is an insult to people’s vote. BJP has a clear mandate of the people of Karnataka, and the two parties which identified themselves as enemies before the election joined hands after the election defying the voters’ wish and made Kumaraswamy the CM. That the mandate is not for him is repeatedly admitted by Kumaraswamy himself when he, more than once, said that it was Congress’ blessings, not of the people of Karnataka, that made him the CM. Isn’t this a clear admission of defying democratic values? And yet they want people to believe that their act was to save the democracy! By saying this are they saying that all the citizens of India lack objective intelligence? As expected, the real trouble for the Congress has appeared now. It is said that when there is a great flood, snake and mongoose sit quietly on the same branch of a tree to save their lives. But as soon as the flood water recedes, they resume fighting. This exactly is happening in Karnataka at the moment. As the Congress showed its color and grabbed major chunk of ministerial posts, JD(S) members have begun to grumble out of dissatisfaction. The ongoing infighting within Congress has become an increasing headache for the party high command especially when its own members are seen protesting in front of the party office demanding ministerial posts for those who they support. Isn’t this the most ridiculous and outright insult to the political system of India? What is the use of a democracy which allows undemocratic governments to rule states and even the country after spending huge amount of money, time and energy in elections? Rahul Gandhi and its brand of political leaders need to realize that Indian politics is no more just a matter of giving lectures, visiting places and passing orders. Political heat in Karnataka and infighting in Congress party is no way close to an end. Rather it has just begun and is likely to get murkier with time. The sin of what is termed as an unholy alliance seems very much around haunting the Congress party. It remains to be seen how many more months the new government survives. Until now they have not been able to complete even portfolios allocation. This itself is a proof how much dissatisfaction prevails within the party members. As expected, the Congress, which had no choice but support JD(S) for its own survival has now taken grip over JD(S) and is dictating who would do what. The most pitiable situation is of the CM who is left practically with no power. Knowing how Congress functions. this had to happen. How much Kumaraswamy will tolerate this, and even if he tolerates for the sake of his chair, how long he will be allowed to be there is another question. All these events have exposed the so-called saviors of democracy and there is more to come. Do not surprise if the government falls soon or before the general elections 2019. Sure they will try to do all possible to save the alliance as their eyes are on future and any crack in this alliance can cause immense damage to their mega plan for upcoming elections. Having witnessed this grand deception, how the people of India will trust such alliances while voting for the future of India is a million dollar question. Shameless fighting for cabinet seats and making alliances in the name of saving democracy but trying to grab power by hook or by crook at the first opportunity have become symbols of opposition parties today. 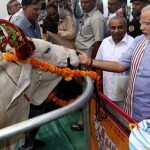 Intelligent people will not want to vote for such temporary alliances made of opportunists when on the other hand the NDA is able to provide and has provided a stable and efficient government under the popular leadership of Prime Minister Narendra Modi. The rest remains to be seen. People need to rise above personal agendas, envy and enmity if they want the country to prosper. 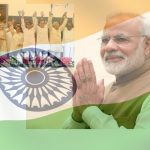 No sane and neutral person will deny that India has made a significant progress on almost all fronts under the able leadership of Narendra Modi and it is sure to progress more if he continues to lead. Progress dost not mean only strong economy and well planned infrastructure. Real progress includes religious values. It is up to the citizens of India to make a right choice. 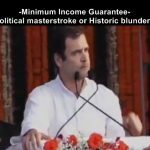 Minimum Income Guarantee – Political masterstroke or Historic blunder? 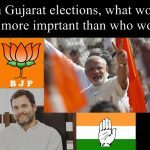 Who lost Gujarat elections? Rahul Gandhi or Congress? Next articleIf Trump and Kim can leave the past behind and be happy, You also can!